The Clavinet produces sound by the mechanical action of hammer tips striking down onto a set of strings when the keys are depressed. The hammers were made of an orange substance known as "Urepan", a European rubber compound made by Bayer in the 1970's. Unfortunately, time, heat and moisture caused these tips to deteriorate, making them soft and mushy. Even in the most well-cared for Clavinets, the deterioration of the hammer tips caused the strings to notch a "groove" into them, causing the keys to stick and make an unpleasant "popping sound". By the 1990's, many clavinets were rendered useless by this phenomena and the instrument had sunken into obscurity, with no support or parts available anywhere. 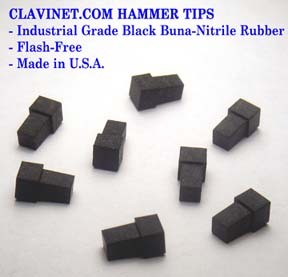 In 1999, Clavinet.Com "came to the rescue" and invented the first aftermarket molded replacement clavinet hammer tip set, which literally brought clavinets everywhere back to life. This sparked a renewed interest in the instrument and led to the development of Clavinet.Com's extensive product line. Our signature Clavinet Hammer Tip Set is made of the strongest Black Buna Nitrile, an industry-standard rubber compound known for its durability and strength. They were created using advanced injection molding techniques and feature a one degree taper for smooth insertion, making do-it-yourself replacement a cinch. No bending or cutting is required and no tools are needed. They were designed from original specifications to maintain proper hardness and molded into a proper "T" shape, making them the most authentic O.E.M. reproductions available today. Clavinet.Com hammer tips are also de-flashed to give them a superior fit and finish. Top quality. The Hammer tips come in sets of 62 (60 + 2 spares) and come with a 30 day MONEY BACK GUARANTEE.